Yes! The leaves have finally changed and have kinda-sorta fallen. Whoever thought something dying could be so beautiful? *pause* OK… I won’t be morbid, but this time of year is gorgeous and… freakin’ cold. New Yorkers? I know, you know, what I’m talkin’ about. I don’t know how this outfit was created honestly, but I was just having fun with my massive scarf collection, and found this gem buried near the bottom. 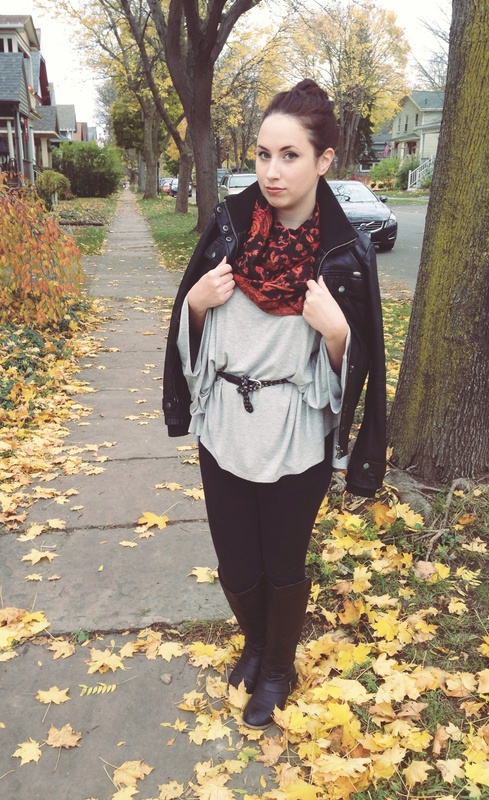 The scarf kind of created the rest of this fall outfit and I dig it! The faux leather jacket is from Guess and the cotton grey flowy top is from Urban Outfitters. If I’m not mistaken the boots and veggies(not fixing, too good! aka. leggings) are from Target, but I honestly can’t remember!